The Yes Men’s Andy Bichlbaum (left) and Mike Bonanno. Bichlbaum will speak about our federal election this week. Jacques Servin is a man of many names. A professor at Parsons by day, Servin moonlights as Andy Bichlbaum, one half of the hoax-activist duo the Yes Men, who notoriously impersonate politicians and business executives. Servin has pretended to be fictional people—like Dow Chemical spokesperson Jude Finisterra—and real ones, such as Canadian Environment Minister Jim Prentice. But it will be as Bichlbaum that he takes the stage at the Royal Cinema on Thursday night for “The Yes Men Live! an event organized by the Department of Culture and Project Democracy. Since they began posing as Bush supporters at Republican conventions in the late nineties, the Yes Men (comprised of Servin and Igor Vamos, a.k.a. Mike Bonanno) have appeared at conferences and on news channels as representatives from the World Trade Organization, ExxonMobil, and the U.S. Department of Housing and Urban Development. In their own words, the Yes Men use their tactic of “identity correction” to “publicly humiliate” profit-driven capitalists. 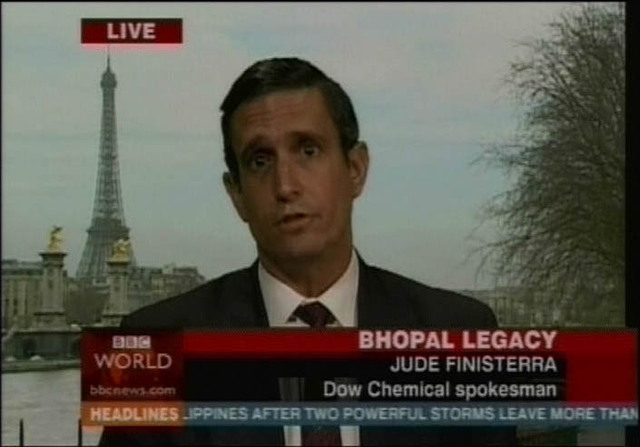 Posing as a Dow Chemical spokesperson, Bichlbaum declares that the company will donate $12 billion to those affected by the Bhopal incident. To Stephen Harper, the antics of the Yes Men may be little more than immature hijinks. Yet it’s possible that Bichlbaum could wind up inspiring a generation of pranksters to pull a fast one on the government simply by filling out a ballot. Images courtesy of the Yes Men. 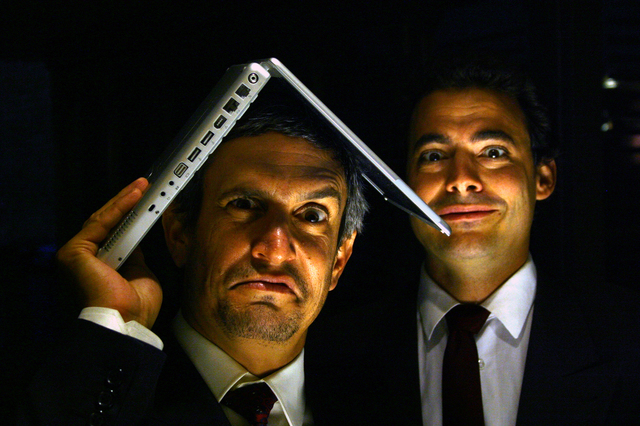 The Yes Men Live! takes place at the Royal Cinema (608 College Street) at 7 p.m. on Thursday, April 14. Doors open at 6:30, and admission is PWYC.